Listed in M&R as 2M-337. Also identified as THN-FM-NGC-01 with a mintage of 6,977. Once again, in order to obtain this specimen a Franklin Mint complete set of the National Governors’ Conference Statehood must be dispersed. 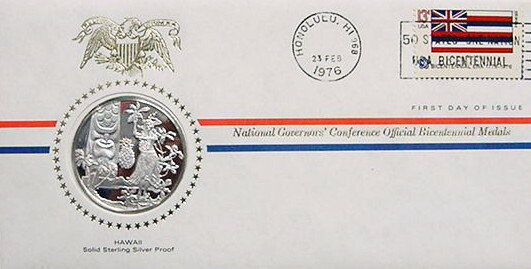 Cachet/franking indicates “bicentennial” as the 50 state cachets were issued from 1974 through 1978 to commemorate the 200 anniversary of the US.